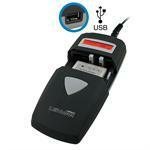 RLI-018-.9 : 3.7 volt 950mAh Li-ION battery for Logitech Dinovo Edge & Dinovo Mini TV wireless remote. Also fits models F12440071, M50A, Y-RAY81. Replaces battery # 190304-2004. Re-charges with original stock charger, or with our BCUNI3 multi-charger.